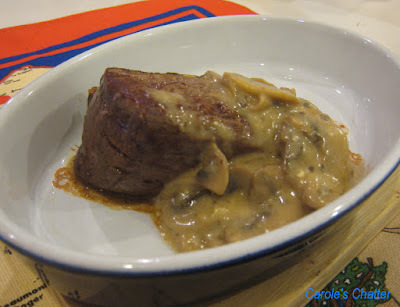 Carole's Chatter: Steak Diane – Retro Fun! Steak Diane – Retro Fun! I am not sure how authentic my Steak Diane was but it turned out nicely – particularly the sauce. When the steak was resting, I deglazed the pan with a small spoonful of plum vinegar (you could use wine vinegar or white wine) and then added that to the sauce as well. I am not an expert on cooking steak. This one was expensive wagyu sirloin (produced locally). I simply fried it quickly in a hot pan, turning only once and then put it into the oven where the vegetables were roasting for about 10 minutes (longer if you don't like it pink in the middle). Later I checked out an old fashioned recipe for Steak Diane – which used to be the height of sophistication in the 70's. In addition to my ingredients, you would have to add finely chopped shallots, Worcestershire sauce, dijon mustard and parsley. That's a blast from the past! I think that's the meal I made after reading The Likeness by Tana French.